Vacation in an Architectural work of Art: BirdHouse by the Panama Canal. Bird House is a one-of-a-kind tropical 'outdoor in' home featured in design magazines in Europe and the Americas. Our home in the historic Panama Canal town of Gamboa provides our guests a unique opportunity to experience tropical nature next to one of the modern wonders of the world, the Panama Canal. Designed by Patrick Dillon, Bird House features double height ceilings, a fabulous kitchen and and an expansive deck connected to a 10M pool from which to enjoy the tropical world that is our back yard. Wake up each morning to the 'fly over' of hundreds of parrots. Enjoy coffee from our Boquete farm on our deck while listening to monkeys howl from the adjacent Cerro Pelado jungle. Or end your day with cool drinks enjoyed from the master bedroom balcony while glimpsing huge ships transiting the Panama Canal. Our pool is a great place to cool down after a day hiking or biking the trails around Gamboa, or birding on the world-famous Pipeline Road. We are a 15-minute walk to the public dock where you can hire a boat and a captain for a morning or day of fishing for peacock bass, snook and the elusive tarpon. Rent kayaks from the Gamboa Resort and hope that manatees roll under you as you paddle up the Chagras River, while searching for caiman on the river banks. Gamboa also hosts the Smithsonian Tropical Research Institute, and is the take-off point for crossing the Panama Canal to the world-famous Barro Colorado Island and Nature Monument (access with advance reservations only). Bird House is a 25-minute drive (longer with traffic) to the beating heart of Casco Viejo, the historic center of Panama City. The Casco teems with small outdoor restaurants, unique cultural venues and wonderful views of Panama Bay and modern Panama City. We are a 15-minute drive to the Pan American Highway that will take you west to the beaches of the Pacific Coast (and our Rio Mar Surf Platforms in San Carlos - 70 minutes), or east to the Transisthmian highway, and then north to the coral reefs, blue waters and Captain Morgan's pirate enclave on the Caribbean Coast. Our tropical house brings a new design to the former Canal Zone territory of Gamboa. 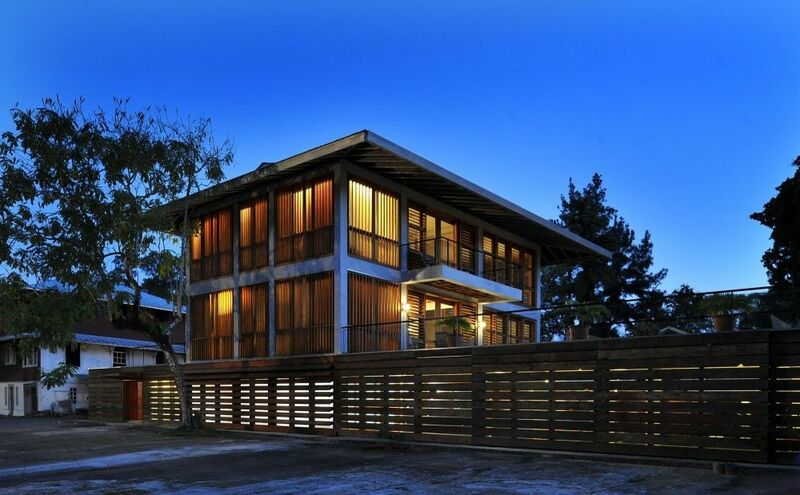 This three-story house is a one-of-a-kind space, designed to respond to the natural and cultural attributes of Gamboa. The home features an environment-friendly design constructed in concrete and plantation teak louvered walls. The ground floor has A/C while the first and second floor do not; the oversized eves shade the sun and the louvered walls and large screen doors direct the airflow of prevailing breezes, keeping the 1st and 2nd floor well ventilated. The open layout of the house permits an inside-outside approach to living with nature that accentuates the sounds, smells and views of the surrounding tropical forest and Panama Canal. * The second floor features a master suite with a balcony that overlooks the interior courtyard, the pool, and views of the Panama Canal. This room was designed to take advantage of the daily path of the sun and natural site air movements to create a bedroom with wonderful light and natural ventilation. There is a walk-in closet and beautiful high-end finishes are featured in the double bathroom. * The first floor has a modern open style kitchen with large marble countertops connecting to a spacious living and dining room with a 25ft ceiling. The kitchen is well equipped and a delightful space for cooking and entertaining. The dining/living room has a family table with bench seating and end chairs for 8, and beautiful custom-made couches and chairs, designed by the owner. Two large decks open off the kitchen and living area via large sliding wooden doors. When opened, there is a seamless connection between the outdoor and indoor spaces, creating both visual and physical expansiveness. The larger deck overlooks the interior courtyard and features: built-in bench seating, a 10-meter swimming pool, a Japanese style shower house, deck furniture and a gas BBQ. This is an ideal place to relax by the pool, watch hummingbirds dance around the interior courtyard and enjoy dinner with views of the tropical rainforest. *The ground floor is the only space in the house with A/C. The ground floor has three single bedrooms, each approximately 10’x12’. Each room has a built-in bureau, closet, desk and relaxation nook with views into the interior courtyard. Each room opens into a large, 20’x30’ air-conditioned space with a pool table and day beds that are great for lounging. The ground floor bathroom area has three sinks adjoining two bathrooms, one with a toilet and bathtub and the second with toilet and two showers. Rio Mar Surf Platforms: One of the many unique features of Bird House is opportunity to use our Rio Mar surf platforms in San Carlos. Located about 70 minutes from Gamboa near a beautiful Pacific beach, our platforms permit our guests a wonderful beach experience to complement their Panama Canal and jungle adventures. Guests who book Bird House for a week or more are offered one night gratis at our Surf Platforms (midweek, depending on availability -- we will do everything possible to ensure availability). Your stay at Bird House: Guests have access to the entire home, pool and grounds. Our house will be yours to enjoy as you wish. You will have complete privacy, although there is opportunity to arrange for maid service and/or a cook if you so desire. We ask our guests to pay staff directly as we do not take a percentage of their service. We will let you know how much staff expect to receive for their service. More on Gamboa: Gamboa is a green, walkable community bounded by the Chagres River, the Panama Canal (Lake Gatun) and Soberania National Park. Gamboa is 25 km outside Panama City and a one-hour drive to both the Atlantic and the Pacific Oceans. Gamboa offers world-class birding. The town is the entry point to Pipeline Road, a wonderful walk through the jungle and some of the best birding in the world. The species list for Pipeline Road exceeds 400, and if you know your birds you can see or hear 100 species in a morning’s walk, not to mention monkeys, anteaters, sloths, etc. Gamboa is also a launching point for fishing expeditions on Gatun Lake or kayaking the Chagres River. This house offers itself to spending time enjoying the sounds of the Panama Canal and the rich Panamanian tropical rainforest. * 2km away from the entrance of Pipeline Road—a historic road that is a world-class destination for bird watching. * 4 km away from the Panama Rainforest Discovery Center. * 650 m (7-min walk) from the only convenience store in Gamboa. * 5 min walk to views of the Panama Canal. * 1 km from the Gamboa Resort. * 1.6 km from the public dock where tour boats and fishing boats depart. Getting around: We have contacts for transportation to and from the airport as well as touring Panama and the surrounding areas. We can also help connect you with one of the best tour/birding guides in Panama. Again, we do not charge for these services, and ask you to pay the service providers directly. We will help you negotiate rates. Hi, I'm Chimene Longwater. I was born and raised in the beautiful coastal town of Savannah, Georgia. My husband and I moved to Panama in 1989 when he became a staff scientist with the Smithsonian Tropical Research Institute. Our three children were all born in Panama and raised in Gamboa and consider themselves lucky beyond belief to have been given the opportunity to call Panama and especially Gamboa their home. I would love others to see the beauty and enjoy the uniqueness of the house that we designed with our close friends Patrick Dillon and Beth Coates. Our daughters have recently graduated college and are making spirits in San Francisco and art in Oaxaca. Our son is a junior at Colorado College. We moved to Miami where my husband was the founding Chief Scientist and Senior Vice President for Education at Frost Science, and where we still live. We travel back to Panama frequently to visit our two homes in Gamboa, our Rio Mar Beach Platforms and our coffee farm in Boquete. With have explored every part of Panama from the mountains to the jungles, both coasts and the islands of Bocas del Toro, Guna Yala, Las Perlas and Coiba. We designed and built this property because Gamboa is a historical gem preserved in time, and located only 25 minutes from Panama City, traffic permitting. Gamboa is a unique and fantastic place to enjoy the beauty of the tropics with all of its lush and exuberant wildlife juxtaposed with the industrial history of the Panama Canal. We love the combination of the natural and cultural history of Gamboa, and it was the ideal location for the home and life we wanted to build for ourselves. Gamboa is the last Panama Canal Zone town that remains mostly unchanged from its origins in the 1930's. It has the good fortune of being at the end of the road, situated halfway up the Panama Canal nestled within Soberania National Park. The Panama Canal borders Gamboa to the west, Soberania National Park forms the eastern and northern limits of the town, and the Chagras borders its southern edge. Gamboa is completely surrounded by forest and water. Whatever your interest in tropical nature, it is exuberant in Gamboa and in the nearby forests and waterways. Find world class birding or jungle trekking on Pipeline Road which begins 2 km from our house, or superb peacock bass and snook fishing on Gatun Lake or the Chagres River. If you look you will see 100s of species of birds, at least 3 species of monkeys, anteaters, agoutis, coatis, capybara, sloths, caiman and, with luck and persistence, the possibility of kinkajou, jaguarundi, ocelots, maybe even jaguar. Gamboa is a lovely, tranquil town for early morning or late afternoon walks or runs. One can appreciate the daily activity of the Panama Canal Dredging Division, watch big ships transit the Canal, hear the sounds of the jungle and appreciate the remarkable architecture and town planning of the old Panama Canal Zone. Facing Lake Gatun that is part of the Panama Canal. We are located in Parqrue Sobrania, half way up the Panama Canal with a view of Gatun Lake. Wifi through out the house. Towels for bathing in addition to towels for the pool. Open living room with large sofa and chairs. DCS Gas five burner oven/stove. Full sets of dishes and glassware. Enough to host your family and friends. Fully equipped kitchen, with dishwasher, microwave, side by side freezer refrigerator, ice maker, toaster, coffee maker, high speed blender, garbage disposal. Gourmet gas oven and stove. Exhaust hood. Large Picnic dining table that was built by an old time canal zonian who worked that the Dredging Division. Balcony off of the masterbed room that looks out over the forested hillside. Huge deck that wraps around an interior court yard. Wonderful house for family and friends to escape to the quiet of nature and enjoy an interesting architectural concept. The house is suitable for all ages. If you have an aversion to nature then this is not a place to be. 20 foot pool that is 4 feet deep. A magnificent house with a pool, amazing breezes, a desperate kid or quiet sleeping area (air conditioned)- the house alone is a vacation onto itself with swimming, a pool table, ping pong and more. And then outside the rain forest, lake Gatun... Chimene had amazing recommendations and our trip was near perfect. I’m so relieved we did not stay in the resort but then it was also nice to have it there to use the trails and see their facilities. Recommend Pipeline Road with Saul, the most amazing bird guide; Playa Blanca outside portobelo; walking along the chagres through the resort jn the evening (monkeys!! The most magical forest); drinks on the porch in a Friday night with the da and baseball game below; and experiencing the sad heartbreaking beauty of the town of gamboa. We will return! Excellent property and the owners were quite accommodating. Excellent birding! Refreshing pool! As above. We all recommend the Birdhouse without any reservations and Gamboa has lots to offer. This house is a truly unique experience as it is open to the environment, creatures sounds and all! We had a great time here experiencing and it is perfect for those that love nature. From the moment we arrived in the pouring rain we saw an agouti and as the sun came out so did all the birds! Chimene, who owns the property was very helpful from the off. She put us in touch with a private guide who took us on a boat onto Lake Gutan where we experienced close up the ships going up and down the canal, the local wildlife and local Indians. We stayed out of season, but even in season there is little in the way of restaurants, so you must bring food with you or eat in the local hotel up the road. The house is equipped with everything you could possibly need to cook though, it really is home from home. Don't stay here is you don't like bugs or the odd bat flitting about, this house is about as close to nature you can get but still be inside!! Spectacular Home in the Jungle! Our family has traveled all over the world (50+ countries), and we've never stayed in a house quite like this one. We really wanted to get out of Panama City and be closer to the jungle, canal, etc. The home provided a perfect base for 5 nights of our trip in Panama. The architecture and design is very unique, the location is in a nice part of the quiet town of Gamboa, and the Gamboa Rainforest Resort is only a 10-15 minute walk away. We did a sunset boat cruise, the aerial tram tour, the ecological exhibits (butterfly garden, orchid center, and frog house), and the new wildlife rescue center on property. All were pretty good. We cooked most of our meals ourselves in the fantastic kitchen, but we did have a couple meals at the Resort which were actually pretty good. For a family of 6 (2 parents, 2 grandparents, and 2 young children), the house was perfect. The open air design made us feel like part of the jungle, and we enjoyed hearing and seeing birds from the house and decks. Even when it was hot outside, the house always felt very comfortable with all the air flow (and the basement level is air conditioned). The toys, board games, and books were a great hit with our kids, and there were many interesting books upstairs for the adults. We used the swimming pool daily, and we even played a little on the pool table and ping pong table. Chimene, the owner, was delightful to work with and was available before, during, and after our stay to make sure everything went smoothly. I also walked to an ATM and a little convenience store in town and had no issues finding anything. We've been raving about this place to friends and family since we returned, and I expect we will tell anyone visiting Panama it is a "must do" part of their trip. I've rated other vacation houses that were perfectly nice 5 stars....this truly perfect house deserves more like 7 stars. The house is unique and a special experience. There is plenty to do in the area for day trips but our family also enjoyed hanging at the house where we could read on the deck, watch the parrots fly across the sky, and our college age boys could play ping pong or pool. The kitchen was great and we cooked in for all but one lunch in Panama City. We highly recommend it and the owner, Chimene, was very helpful and considerate. I rented this house with 10 friends for the weekend and we had an amazing time. The house provides an amazing outdoors feeling with the open living room and kitchen design connecting to the nature outside. The swimming pool and deck is amazing and the "kids" play room are perfect for hanging-out while playing pool. On of the best surprises was the FULLY equipped kitchen (as a real home and not as rental house). Even though on the top level there isn't air conditioning, the open design provides a fresh breeze during the day (complemented by fans). If you are looking for a house with lots of contact with nature and to hang out with comfort, this is the perfect house. The host was very thoughtful and organized. Everything was very well coordinated. Located halfway up the Panama Canal in the historic Panama Canal Zone town of Gamboa. Home to world class birding. World famous Pipeline and Rainforest Discovery Center 1 mile easy hike from our door step. Situated in the heart of the Smithsonian Tropical Research facility in Gamboa. Science and scientist abound as does the pick up point to visit Smithsonian's Barro Colorado Island. 20 minute walk to the public dock where you can get a guide and fish for peacock bass or go sight seeing up the Panama Canal or up the Chagras River. We are a 10 minute car drive to the Pan American Highway that crosses the Panama Canal and heads west to the best Pacific beaches. We are a 10 minute car drive to the Transisthmian Highway that travels north and takes you to the mysterious and beautiful caribbean coast. Alternatively you can drive into the heart of Panama City in 25 minutes for dinner in Casco Viejo. We have two local resorts close at hand. The Gamboa Rainforest Resort and the Radisson Summit Golf Resort. Both have nice restaurants and bars for a change of pace.